If reading Harry Potter wasn't enough to convince you that having a pet owl would be amazing, this video will surely push you over the edge! Oakley is a great horned owl, and he's made a new best friend. Watch the video below to see just how adorable these two are together. As a baby, Oakley was rescued by the Eagle Valley Raptor Center. 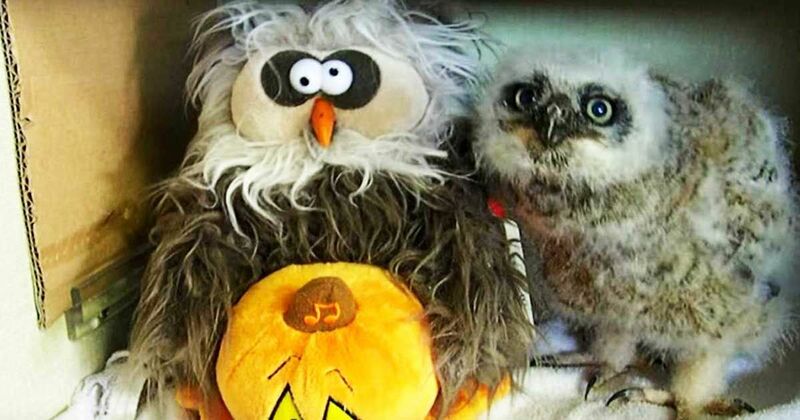 Typically, the Center puts several baby owls together for companionship and comfort, but Oakley was alone, so they found the next best thing. Covering himself with a sheet so Oakley wouldn't think he was being fed, the rescue worker pushed a button on the toy owl to see how Oakley would react. Check out the hilarious results below! Apparently, music speaks to more than just humans! The owl mimics his companion's movements, seeming to dance along with the tune. His big eyes and head swivels are definitely swoon-worthy. Oakley was released back into the wild a few weeks after the video was filmed. The Eagle Valley Raptor Center helps protect birds of prey in Kansas. They help injured animals heal and become independent so they can return to the wild.